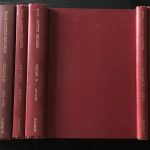 Folio, 16 vols of auction book records spanning 1974 to 1996 with years ’81-2, ’82-3 and ’86-7 missing, as well as ’92-3 up to 1996. (Nos 72-3-4-5-6-7-8; 81-2-3-5-6-7-8-9; 94). Publisher’s red coated cloth. Good condition.